In my last column I examined one particularly stark manifestation of the state counterinsurgency/surveillance apparatus; the use of so-called Forward Intelligence Teams (FITs) by the police to meticulously document political demonstrations. In response, recent years have seen the development and spread of a range of grassroots initiatives aimed at counteracting such state monitoring of political activity. Within the UK, the group FITWatch has physically obstructed police surveillance operations, as well placing FIT officers under a form of inverse surveillance (or sousveillance), and publishing their names and photographs in a style that mimics the police’s own “spotter cards”. Similar tactics have been developed throughout Europe and the US with varying degrees of sophistication; one group even using their own airborne surveillance drone to monitor police movements from the sky. Such efforts have become a vital resource in challenging not only police surveillance operations, but also the misuse of statutory powers and other forms of misconduct (such as concealing shoulder numbers), both in the courts, in the press, on the streets and online. This June the High Court ruled that the police can no longer retain photographs of individuals without criminal records (although the precise implications for FIT surveillance and the policing of protest remain to be seen). Furthermore, it has been suggested that policing’s “new visibility” – the presence of counter-surveillance activists and ubiquitous “citizen journalism”, in addition to the mainstream press on the front lines of protest – may serve to moderate police behaviour, leading to less repressive, even “gentler” crowd control tactics (although for many, personal experience undoubtedly speaks otherwise). Perhaps most empowering on an interpersonal level, the use of so-called sousveillance tactics furnish protesters with a means of confronting police surveillance on its own turf; meeting the cyborg gaze of the state with a defiant gaze of the “mediated crowd”. This is by no means a purely symbolic exercise but often amounts to a kind of low-intensity psychological warfare between protesters and police. In publicising and disseminating their images alongside their names and identification numbers, such tactics strip police officers of their institutional anonymity, exposing the identity and individuality normally concealed and suppressed by their uniforms. Activists are thus able to appropriate the surveillant gaze for their own purposes; projecting its individualising, objectifying and accusatory glare, with all its subtle, visceral aggression and anxieties back onto the police. Despite the apparent “democratisation” of surveillance, made possible by the availability of new technologies such as camera-equipped smartphones, huge power imbalances undoubtedly remain in place. Whilst, in an inversion of the type of top-down observation envisioned by Orwell and Foucault, the many may now watch the few, surveillance of the powerful is often “a mile wide but an inch deep”. As such, the depth or intensity of such surveillance is only realised (if ever) retrospectively, when there is some ex post facto need, as exemplified by the inquiry into the killing of Ian Tomlinson in 2009. Furthermore, such tactics represent an issue of some contention amongst protestors, and are regarded by many with scepticism. A frequent criticism is that focussing energy and resources on challenging police surveillance puts activists on the back foot, detracting attention from the original issues about which they are protesting. Conversely, others argue that the right to protest is an issue of such fundamental importance that it is worth fighting for alongside other struggles for social justice. There are at least three potential, unintended and ironic consequences of counter-surveillance tactics. Firstly, such tactics actually appear to render activists exceptionally visible to the police, and invite an array of “neutralisation” tactics in response. The police frequently aim to prevent counter-surveillance efforts either through direct physical force (with activists often the targets of police violence and/or unlawful arrests) or through strategies of containment and concealment (such as, for example, kettling protesters or using police vans to screen violent arrests from view). In addition, the use of sousveillance tactics risks generating a kind of “surveillance arms race”: a Kafkaesque situation in which a spiral of “counter-counter-surveillance” ad infinitum culminates in protesters filming the police while the police film protesters. We are left with a positive feedback loop, a form of “surveillance gridlock” whereby the act of monitoring eclipses both action and its control. Secondly, these tactics are further problematised by the fact that the footage generated, if made publicly available via the Internet, may be rendered a form of “open source intelligence” by the police, with the potential to incriminate protesters caught in the frame. In this context, Open Source Intelligence or “OSINT” refers to information derived from a host of sources that are openly available to the public. According to this presentation, the Metropolitan Police Service has had a unit dedicated to this form of intelligence-gathering for some time. 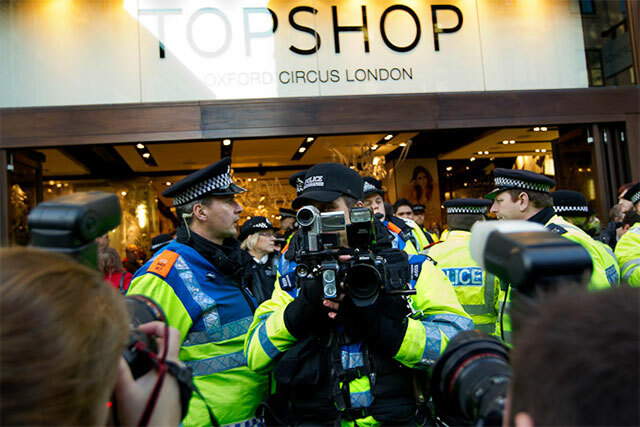 Indeed, activist-uploaded YouTube footage has already been used as evidence by the Met in order to successfully prosecute protesters following the 2011 London anti-cuts protests.Such a situation epitomizes the challenges posed to resistance by the increasing convergence, overlap and integration of previously discrete systems of surveillance. Thirdly, there is the further risk that amidst the sheer proliferation of visual imagery in our postmodern hyperreality, any impact that counter-surveillance might otherwise have is eroded. Increasingly, footage of police misconduct and brutality is reduced to yet another decontextualised spectacle of violence in a culture in which even the most politically radical ideas and images are commodified, and both riots and police brutality become fodder for the latest Kanye West music video or Levi’s jeans advert. For all of these reasons, if sousveillance succeeds as a kind of psychological guerrilla tactic, appropriating and weaponising the surveillant gaze and its psychological effects, it may all too often be a pyrrhic victory, especially when achieved against the backdrop of both substantial asymmetries of power in terms of technological capacity and sheer physical force, as well as a relentless all-encompassing consumer culture. Counter-surveillance can undoubtedly be empowering for protesters: contributing to activists’ safety; increasing the likelihood that individual police officers will be held accountable for misconduct; and in doing so, tempering police harassment and violence; as well as providing a powerful “bargaining tool” for protesters. Furthermore, the dissemination of counter-surveillance footage can generate and contribute to broader discussions surrounding the role and function of both the police and state surveillance. However, simply mirroring the surveillance strategies of the state is not only inadequate, but may often prove counter-productive. In order for counter-surveillance tactics to prove effective, activists must remain attentive to such challenges and contradictions, and cognisant that ‘counter-surveillance images require tactics and narratives to give them political force’.